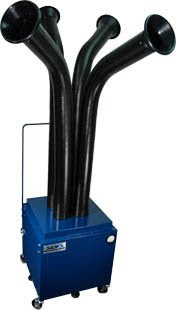 Multi-Operator Fume Extractors - Sentry Air Systems, Inc.
Sentry Air Systems offers a variety of options for those in need of multiple-operator fume extraction equipment. 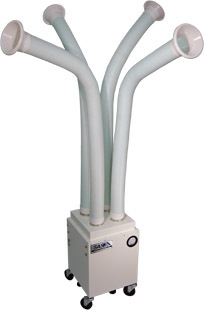 The following source capture units offer a unique engineering control geared toward respiratory protection for multiple operators by utilizing strong fan suction and high-quality filtration media. Sentry Air’s HEPA filters are composed of flame-retardant material and offer 99.97% efficiency on particles .3 microns and larger. Depending on the application performed by the operator, heavy-duty Carbon and specialty-blended material are also used for optimal protection. Pictured above is Sentry Air’s conceptual multi-station extraction unit. 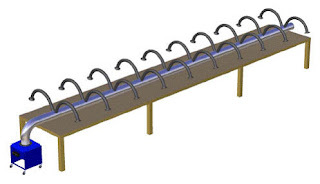 For more information, read this blog entry or visit this unit’s product page.